Fiati is an ensemble dedicated to bringing high quality music performances directly into the communities. The ensemble performs solo and chamber repertoire for oboe, clarinet and saxophone, adding guest artists on additional instruments to provide a wide variety of musical styles. Performances range in style from the masterworks of the 17th to 20th centuries through new works written especially for Fiati. Concerts can be part of a formal series or more informal settings where the artists discuss the music. The members of Fiati are also available for residency programs clinics, master classes and other educational workshops. 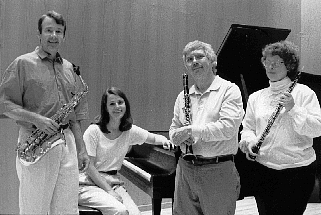 Fiati released a compact disc recording of music for oboe, clarinet, bassoon in 1996 which includes compositions by Jean Francaix, Bohuslav Martinu, Heitor Villa-Lobos and a quartet for reed trio and piano by Florent Schmitt. Valarie Anderson has performed extensively as a soloist and in chamber music concerts in the United States, Canada, Germany and South American, including frequent performances with the internationally acclaimed Audubon String Quartet. From 1983 to 1997, she was principal oboist with the Roanoke (VA) Symphony and Opera Roanoke. She has performed concertos with the Prince George Symphony, Georgian Bay Symphony, Gulf Coast Symphony (MS), and Roanoke Symphony, and has presented solo recitals at International Double Reed Society Conferences. Ms. Anderson has studied oboe with John Mack, solo oboist with the Cleveland Orchestra. Widely recognized as an expert in acoustics and reed making equipment for the oboe, Ms. Anderson is the owner of Jeanne-Inc. and now divides her time between performance and research into new products for clarinetists and double reed performers. John Anderson is professor of music and head of woodwinds at the University of Minnesota School of Music. In addition to regular performances of the standard repertoire for clarinet from the 18th, 19th, and 20th centuries, he has established an international reputation in contemporary clarinet performance and has premiered works written specifically for him involving solo clarinet and clarinet with narrator, tape recorder, synthesizer, interactive computer, and other sound manipulation devices. Anderson has performed throughout the United States and in Canada, Norway, Sweden, Denmark, Russia, China, and Taiwan. He has performed solo and chamber music recitals at conferences including the International Clarinet Society, College of Music Society, and the International Conference of Electronic Arts. Collaborative pianist Laura Loewen, a native of Winnipeg, Canada, has frequently appeared in recital with local and visiting artists. Her performances have been broadcast on CBC Radio's local and national programming. Ms. Loewen is also an experienced teacher and has adjudicated Music festivals throughout the province of Manitoba. She began her training as an accompanist with degrees from McGill University and Brandon University. In 1998, she received a grant from The Manitoba Arts Council to pursue a Doctor of Musical Arts in Accompanying / Coaching at the University of Minnesota, where she is currently studying with Margo Garrett and Karl Paulnack.